My husband is an excellent artist and paints striking pieces of art. The latest one he did quickly became one of our favourites and we hung it in our bedroom on the wall facing our bed. It is the last thing I see before I go to sleep and the first thing I see when I wake up. 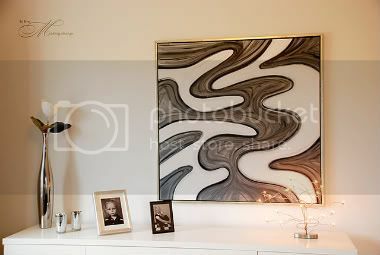 I love the energy it has and it looks so great on the white wall. He hasn't updated his blog in ages and he has several new pieces. I need to get on his back about that. You're right ... there is quite an amount of energy in that painting. I think you've hung it in just the right spot, too. Beautiful painting. You have a very talented husband! It looks perfect where you have hung it.